GPS Parser Display shows the GPS parameters from a GPS module. My original GPS parser Minimal GPS Parser [Updated] used a novel method to decode NMEA messages from a GPS decoder, using a state machine driven by a pattern which was used to match the NMEA sentences. The original version was designed for use with a particular GPS module, but I have now improved the program so that one version of the ParseGPS() routine is flexible enough to work with a wide range of GPS modules. I have tested it with four popular low-cost GPS modules in the $10 to $20 price range, and I give details of these below. The test program runs on an ATtiny85, using four I/O pins to drive the display, and one to process the serial input from the GPS module. // c=Course (Track) - in degrees*100. Allow for empty field. The letter 'j' accumulates digits until a decimal point is encountered. This caters for fields with a variable number of digits before the decimal point. The letter 'c' accumulates digits until a comma is encountered, and ignores a decimal point. This caters for an empty field, output by some GPS modules. Latitudes in the southern hemisphere and longitudes in the western hemisphere are represented by a negative number. 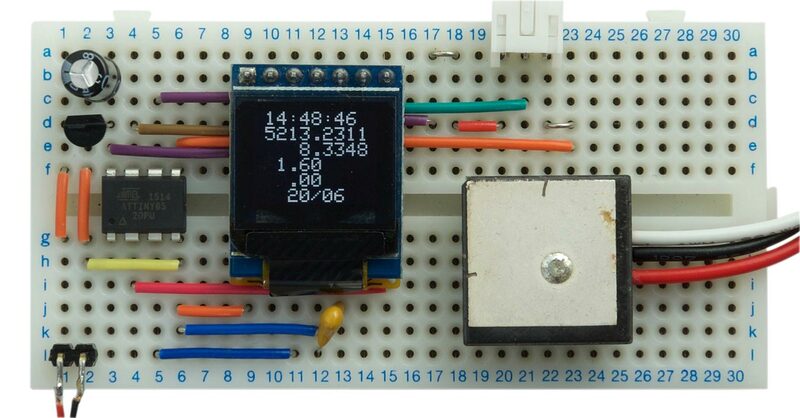 The display has an SPI interface and is available from Aliexpress , or a similar one is available from Sparkfun . 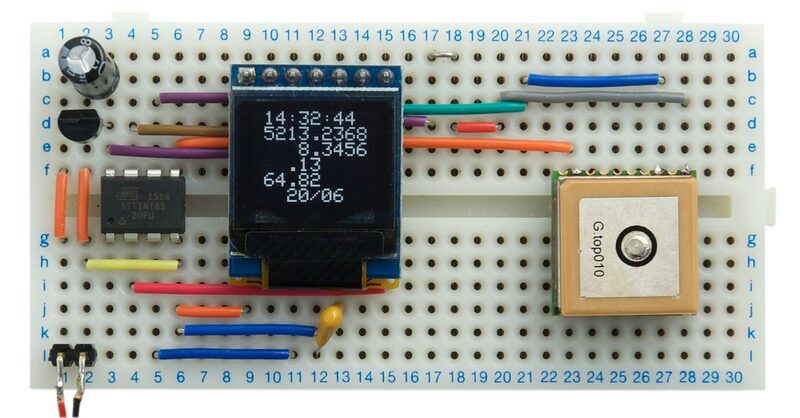 The display program is a version of my ATtiny85 Graphics Display project. To save memory I rewrote the display interface to write characters directly to the display memory, without using a memory buffer. This results in a simpler interface when you don't need to plot graphics on the display like the original project. PlotInteger() - plots an unsigned integer, up to 65535, to the display, displayed with two decimal places. PlotAngular() - plots a latitude or longitude to the display in the format DDDMM.MMMM where DD are the degrees and MM.MMMM are the minutes. To convert from this format to degrees and fractions of a degree divide the number of minutes by 60 and add it to the number of degrees. For example, if the latitude in DDDMM.MMMM format is 5213.2375, the latitude in degrees is 52 + 13.2375/60 = 52.220625 degrees. You can use this format to type the latitude and longitude into Google maps, and display the location. Circuit for the GPS Parser Display which shows the GPS parameters from a GPS module. Because some of the modules are 3.3V I've included a LE33CZ low-dropout regulator to drop the supply voltage from 5V, or from a 3.7V LiPo battery, but this isn't necessary if you're using a module that is happy with 5V. The 33kΩ resistor and 0.1µF capacitor ensure that the display is reset correctly when power is first applied. The ATtiny85 doesn't include a hardware UART, so the serial input from the GPS module is decoded by a software UART, using the ATtiny85's USI interface, as described in the earlier article Simple ATtiny USI UART 2. The processor uses the 8MHz internal oscillator, to avoid the need for an external crystal. My ATtiny85 worked fine with the default setting, but because the serial interface is quite fussy about the data rate you may need to calibrate the oscillator to an accurate frequency using the OSCCAL register. Measure the frequency on PB1 with a frequency meter, or a multimeter with a frequency range. I use the Victor VC921, available from Adafruit  or Banggood . Then recompile the program with different values of OSCCAL until you get the frequency as close as possible to 2000Hz, using large jumps in value first, then smaller jumps as you get close to the correct frequency. 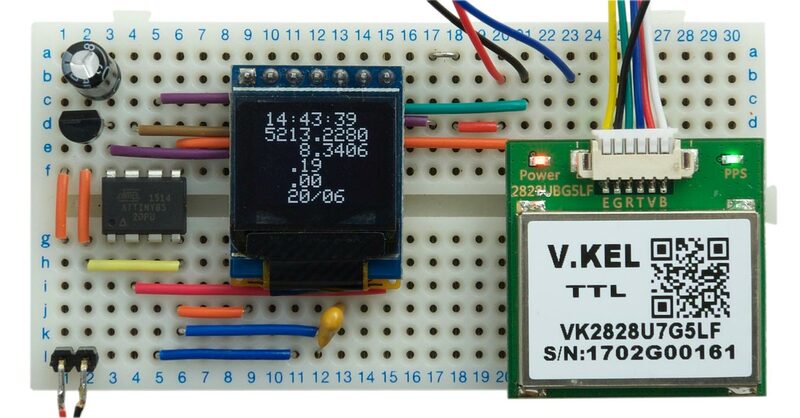 Here's the whole Flexible GPS Parser Display program: Flexible GPS Parser Display Program. Here's a survey of the four low-cost GPS modules I've tested with the program; they all include built-in aerials, and are rated at 2.5m positional accuracy. The GTPA010 or PA6C is a small surface-mount module available from Aliexpress  or from PV Electronics in the UK . Although it's a surface-mount module, it's quite easy to fit three wires to the necessary connections; see Odometer/Speedometer Pendant [Updated]. 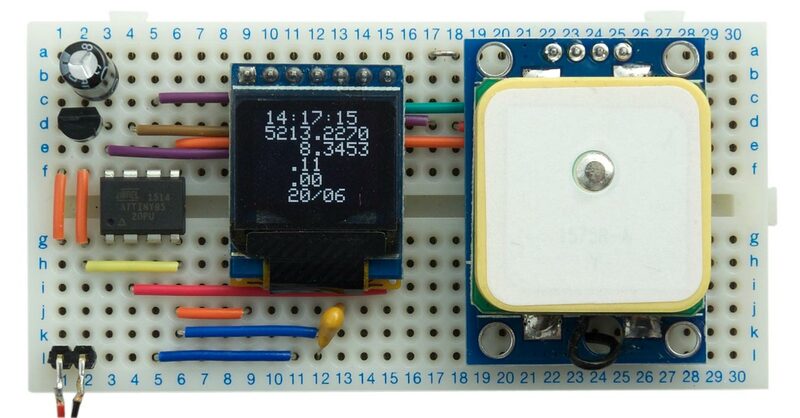 Alternatively, Adafruit provide a breadboard-friendly Ultimate GPS Breakout with a later version of the same module . This is a 66-channel receiver which operates from 3.0V to 4.3V, so you will need to use a regulator if you have a 5V supply. I measured the current consumption at 3.3V as about 22mA. The Ublox NEO-6M is a low-cost receiver, available from HobbyKing  or HobbyTronics in the UK . This supports 50 channels, and the module is compatible with 3.3V to 5V. At 3.3V I measured a current consumption of about 45mA. This is a small GPS module available for under $20 from SparkFun  or HobbyTronics in the UK . It supports 56 channels, but note that it is designed to work from 3.3V, so you should use a regulator to drop the voltage down from a 5V supply. At 3.3V I measured a current consumption of about 40mA. This is a very low cost GPS receiver from Banggood  or AliExpress . It supports 56 channels, and operates from 3.3V to 5.5V. At 3.3V I measured a current consumption of about 45mA. 15th August 2017: Removed a redundant reference to Buffer from the program (ignored by the compiler). 20th September 2017: The PlotAngular() routine in the original version of the program displayed the wrong values for the latitude or longitude when the number parameter was negative. This is fixed in the latest version of the program, and in addition, the values are now displayed with a N, S, E, or W suffix as appropriate. I'm grateful to Miles Treacher for reporting this problem. 23rd September 2018: Corrected the declaration of the character map from uint32_t to uint8_t. ^ Pocket Autoranging Digital Multimeter on Adafruit. ^ VICTOR VC921 LCD Digital Voltmeter Ohmmeter on Banggood. ^ MTK3339 ultra-small GPS module with Dual Antenna on AliExpress. ^ NEO-6M GPS Module on HobbyKing. ^ Ublox NEO-6M 56 Channel GPS Receiver on HobbyTronics. ^ GPS Receiver - GP-20U7 (56 Channel) on SparkFun. ^ 56 Channel GPS Receiver - GP-20U7 on HobbyTronics. ^ Geekcreit 1-5Hz VK2828U7G5LF TTL Ublox GPS Module With Antenna on Banggood. ^ VK2828U7G5LF GPS Module with Antenna on AliExpress.